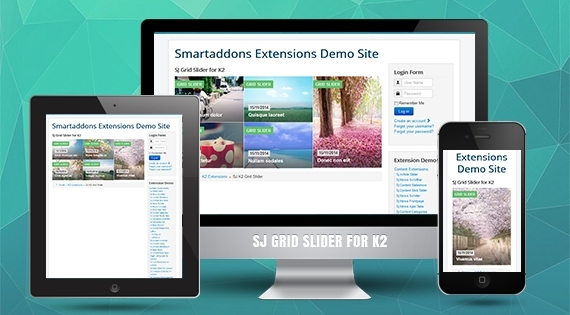 SJ Grid Slider for K2 - Responsive Joomla 3.x module, has been released with K2 component supported... Let's make your website more impressive with our beautiful design. Within a single area of web page, SJ Grid Slider for K2 should be placed on highlighted position to make itself becomes more powerful. Along with variety of professional effects for displaying items on the frontpage, attracting more visitors has become easier than ever. Moreover, the aim of reducing the square of needed information which will be showing and providing a quick overview of items to proper audiences, every two columns with 2 rows, there's one row to be shown on each slide. You can totally control how many items to show on each slide, it depends on you. Especially, this module has full responsive layout and adapts perfectly for all device resolutions. In addition, dozens of features and effects are included, parameters can be configured in the back-end, you can totally set up any item on your website with images, titles, brief descriptions and detail button... as your wish.